Environment Canada says Kitchener has put an old wind chill record on ice, as frigid temperatures caused the mercury to nosedive to a bonechilling -26 with the wind chill making it feel like -41 C.
Waterloo Region has put an old wind chill record on ice as frigid temperatures caused the mercury to nosedive to a bone chilling –25.8 C with the wind chill making it feel like –41, according to Environment Canada. "The airport did record a wind chill of -41 between 5 a.m. and 7 a.m. this morning." Environment Canada meteorologist Geoff Coulson said Tuesday. "That's the all-time coldest wind chill the airport ever had." Coulson said the old record wind chill value was –40.5 C, which was recorded on January 17th, 1982. And Tuesday's raw cold came just short of the old temperature record for January 7, set more than half a century ago. "The coldest January 7th was -26.1 C in 1943, so we were just about 0.3 of a degree shy of beating that record." Forecasters say a reprieve from the bitterly cold temperatures that have encased Waterloo Region and all of Southwestern Ontario in a deep freeze will come later this week, but until then people have been warned that they can expect "more of the same" in the short term. "This bitterly cold arctic air has come all the way down from the Yukon and the Northwest Territories," Environment Canada severe weather meteorologist Rob Kuhn told The Morning Edition host Craig Norris Tuesday. "As a result we've got the wind chills right now they're pushing – 41, the temperature is –25 C. We've got flurries, we've got snow squalls, it's just nasty out there." "It's even cold by Winnipeg standards," Kuhn said. While the agency's snow squall warning ended at 11 a.m. for Waterloo Region, Guelph and Southern Wellington County, it issued a new blowing snow warning, which is activated when blowing snow is expected to reduce visibility to 800 metres or less for at least three hours. The blowing snow warning also applies to Northern Wellington County, including Arthur and Mount Forest. A wind chill warning for Waterloo Region and Wellington remains in place. Kuhn predicted Waterloo Region can expect "more of the same" Tuesday night, although the frigid conditions "will slowly start abating" with wind chill and snow squall warnings dropping off sometime Wednesday. "The temperature in [tomorrow] afternoon might actually peak to – 13 C, which will probably feel balmy considering what we're going through now," he said. However, Kuhn said temperatures will not return to seasonal values until Friday, where the daytime high is expected to peak at – 2 C and the mercury could even push above the zero mark this weekend. "This will be just a typical borderline January thaw of a couple of days and it's going feel quite balmy," he said. As a result of the extreme weather, all classes were cancelled for Waterloo Region public and Catholic schools, as well as for Wellington Catholic and Upper Grand District schools. The cancellations include before- and after-school programs for Catholic schools, evening rentals for all Waterloo Region schools, administration sites for Catholic schools and the Education Centre for the Waterloo Region District School board. Classes at the St. Louis Adult Learning Centre are also cancelled. The Upper Grand District School Board office is closed, but the Wellington Catholic School Board office is open. Classes are cancelled at Rockway Mennonite Collegiate, as well as evening rentals. Bone chilling cold, combined with snow and high winds created dangerous whiteout conditions on many local highways, forcing provincial police to shutdown some routes because they were too treacherous for drivers. Ontario Provincial Police closed Highway 7/8 in both directions between Stratford city limits and New Hamburg at Peel St. because of the weather conditions. Highway 6 was closed between Mount Forest and Fergus in both directions due to weather conditions. Waterloo Regional Police urged drivers travelling in rural areas "to avoid travelling if their trip can be delayed. High winds are causing drifting snow and near zero visibility at times." "At this point there have been no reports of any serious incidents but the potential exists due to the current weather conditions," the force said in a news release. There were several GO Transit delays Tuesday morning including on the Kitchener line and the Milton line. At Region of Waterloo International Airport, both a 6:30 a.m. American Airlines flight to Chicago and a 7:25 a.m. Sunwing flight to Cancun were cancelled. Another Sunwing flight, from Cancun to Waterloo was also cancelled. 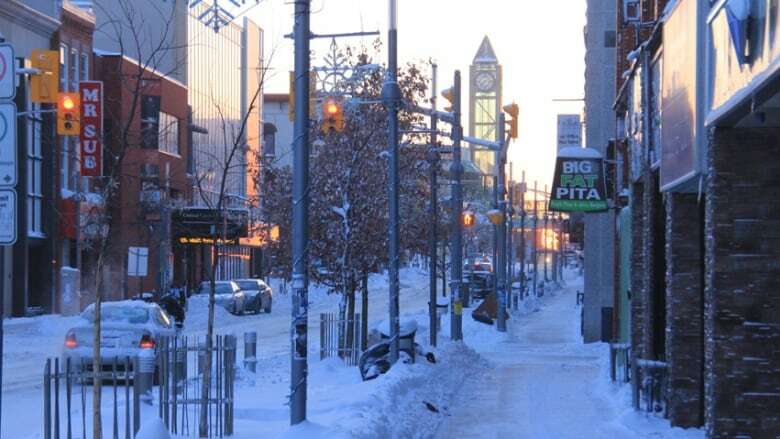 The University of Waterloo, Wilfrid Laurier University and Conestoga College campuses are open Tuesday. The extreme cold also slowed curbside garbage pickup to an almost glacial pace in some areas of Waterloo Region with delays being reported for garbage, green bin and recycling collection. The region announced that waste collection in Kitchener, Cambridge and Waterloo would be delayed by a day due to the numbing temperatures. The region also said that Tuesday waste collection in the urban areas of the townships of Wellesley, Wilmot and Woolwich would proceed as scheduled, "but collection in the rural areas of these townships may be delayed one day. The remaining days of the week will not be affected in the townships." The region said that trucks would be unable to return for any materials uncollected Monday and it asked that residents put the uncollected materials at the curbside for pickup the following Monday.